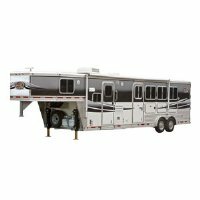 We have a selection of new and used horse trailers for sale. 2 horse bumper pull trailers to 3 horse gooseneck hitch trailers are in stock. We also custom order Featherlite LQ horse trailers, call for more details!